These techniques are being applied to large utility and industry boilers, but their applicability to process heaters is an ongoing process. As there are no new oil refineries or petrochemical plants being built in the U.S, the technologies are used when existing facilities are located in nonattainment areas requiring RACT controls on existing sources or when these facilities expand regardless of attainment status (BACT or LAER). 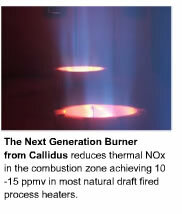 A review of technologies available from vendors that sell low-NOx process heater burners indicates that a variety of combustion techniques similar to those used for boilers can result in reduction of uncontrolled NOx levels of up to 95%. Forced-draft process heaters use single burners similar to a boiler burner with a fan supplying the combustion air. 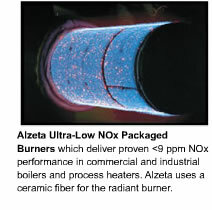 The low-NOx burners for these heaters can employ flue gas recirculation similar to a boiler burner. Natural gas heaters also operate at atmospheric conditions with multiple burners that premix the combustion air and fuel. Low-NOx burners developed for these applications employ staged combustion techniques that use the momentum of the combustion air or fuel to create multiple zones for combustion. 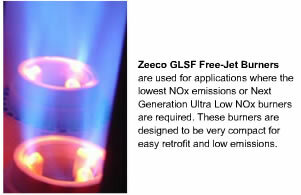 Retrofit applications on these heaters resulted in reduced NOx emissions from conventional burners up to 90%. Sulfur oxides can be controlled by fuel desulfurization or flue gas treatment. Carbon monoxide and hydrocarbons (HCs) can be controlled through higher combustion efficiency. The MACT standard for process heaters is the same as that for boilers: facilities that are major sources with new heaters with heat inputs in excess of 10 MMBtu/hr must limit CO emissions to 400 ppm at 3% O2. This can be met with proper combustion control.